Drunken Chocolate Cherry Cake is one of those delicious cakes that takes a little effort but once you taste it you will know it was worth every second in the kitchen. This recipe is simple and decadent! 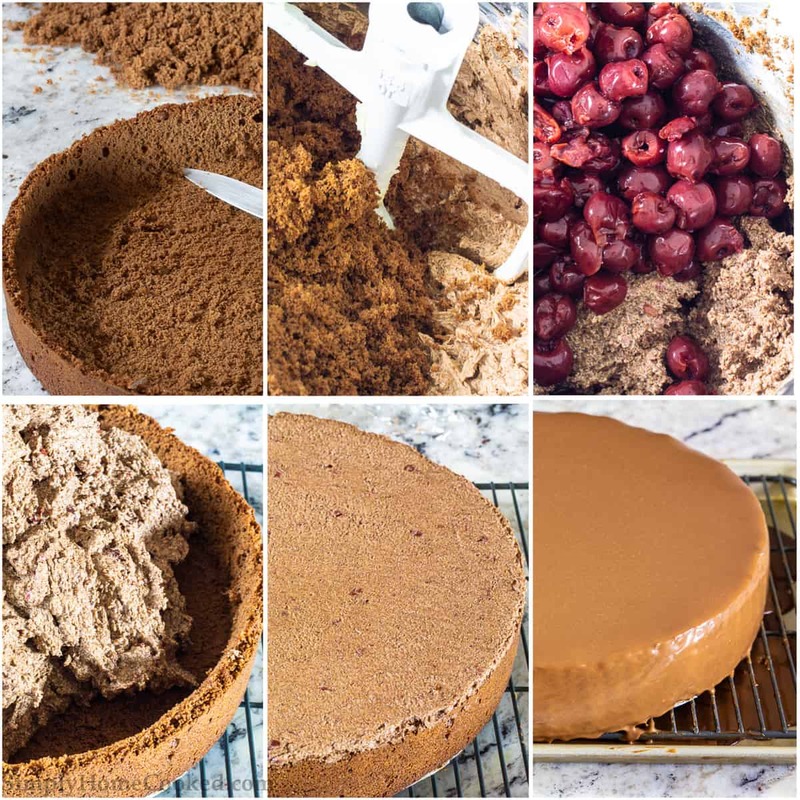 If you like cherry but want something a bit lighter, you may enjoy making our homemade cherry Jello cake recipe for your family. This recipe was originally posted December 15, 2015, we’ve tweaked it a bit since then. This post may contain affiliate links. Read my disclosure policy here. Rum soaked cherries, chocolate buttercream, and chocolate cake crumbles are the key ingredients of a drunken chocolate cherry cake. This cake is one of the most highly requested cakes at parties. It has such a luxurious flavor that has you reaching for seconds the moment you finish your last bite. The rum soaked cherries give the cake a slight tartness and a nice kick the really compliments all the chocolatey goodness. I have to admit, this cake is quite time-consuming. But it’s so worth it. Keep in mind, this recipe calls for a 12 inch round baking pan. I know it’s quite large, but it’s a party cake, which means lots of people. Even if it doesn’t get eaten all at once, you can keep it in the freezer instead of the fridge. It will last a lot longer and I actually kind of like eating it partially frozen, It’s quite refreshing. For measurements and complete directions see the printable recipe below. Combine cherries, sugar, and rum into an airtight container and shake well. Leave refrigerated for up to 3 days. Sift dry ingredients together and set aside as directed. Prepare eggs by beating until foamy then adding in sugar as directed. Heat egg mixture while beating as directed ensuring they do not get too hot. Once the mixture is doubled in volume, add in dry ingredients carefully. Pour mixture into baking pan and bake as directed. After the cake has cooked through, allow it to cool, and follow directions for removing the inside cake layer to create a shell. Heat eggs, sugar, cocoa powder, and milk as directed until the mixture thickens. Be careful to not allow eggs to boil or overheat as they will scramble. Allow this mixture to cool down. Next, beat together butter and sugar until it becomes fluffy. Strain cherries you have been soaking and add the liquid into the butter and sugar mixture until well combined. Finally, you will combine both mixtures until just combined. Using the cake crumbs you removed from the cake shell, blend into the chocolate buttercream mixture. Next, you will fold in your strained cherries to combine. Fill the cake shell with this mixture being careful to not damage the sides of the cake. Top with my chocolate ganache recipe prior to serving. Display this drunken chocolate cherry cake with a chocolate ganache coating and a few sprigs of greenery and some sugared cherries. 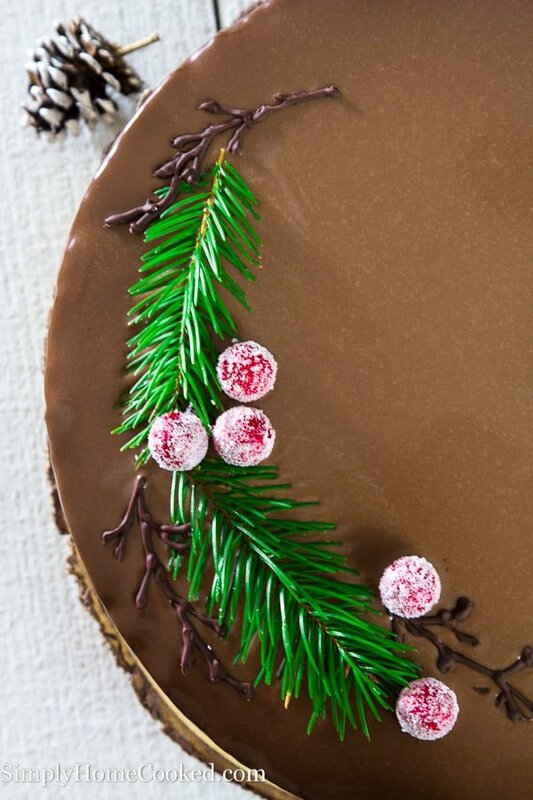 Use a bit of melted chocolate piped onto the top in the shape of twigs to create a pretty presentation. My drunken chocolate cherry cake is worth every minute it takes to create. 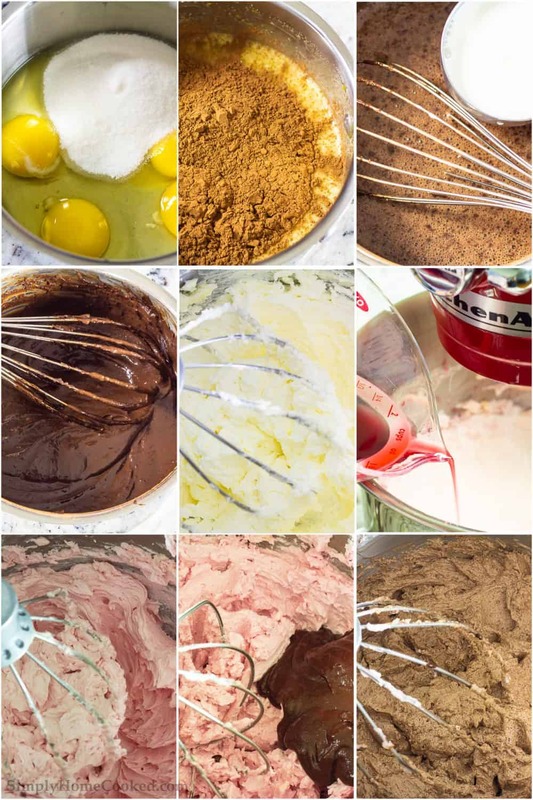 Alongside this, I love serving some of the other delicious dessert ideas linked below. 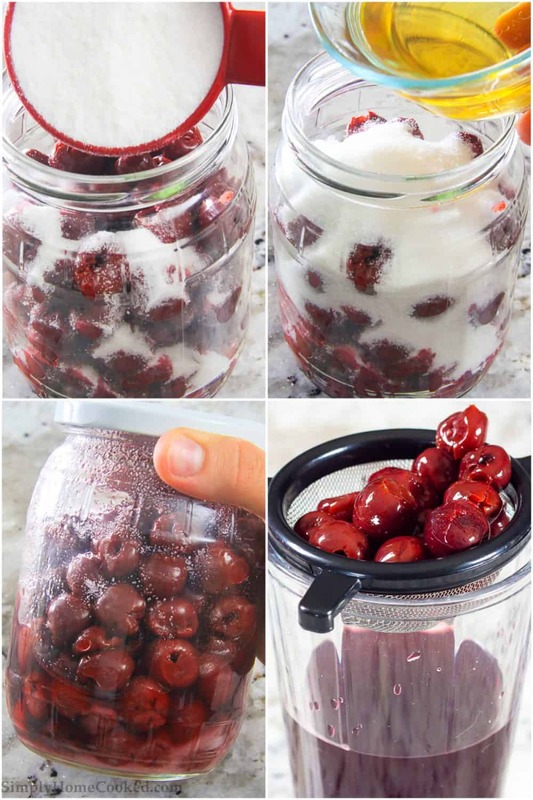 Fill a mason jar with 3 cups of drained sour cherries. Add 1/2 cup of sugar and 1/2 cup rum and close the duo tightly. Shake vigorously until all the ingredients are well mixed. Let it sit in the fridge for 2-3 days making sure to shake the jar occasionally until the sugar dissolves. Sift 3/4 cup cocoa powder and 2 cups of flour together. Then set aside. In a large heatproof bowl, beat 10 eggs on high speed with a handheld mixer. Mix until the eggs become foamy, then add in 2 1/2 cups sugar. Keep mixing for another 5 minutes. Transfer the bowl of beaten eggs and sugar on top of a pot with about 1 inch of simmering water (double boiler). Keep the pot over low heat and constantly mix the mixture with an electric mixer. About 10-15 minutes. It should double in volume. Gently fold in the cocoa and flour mixture using a whisk. 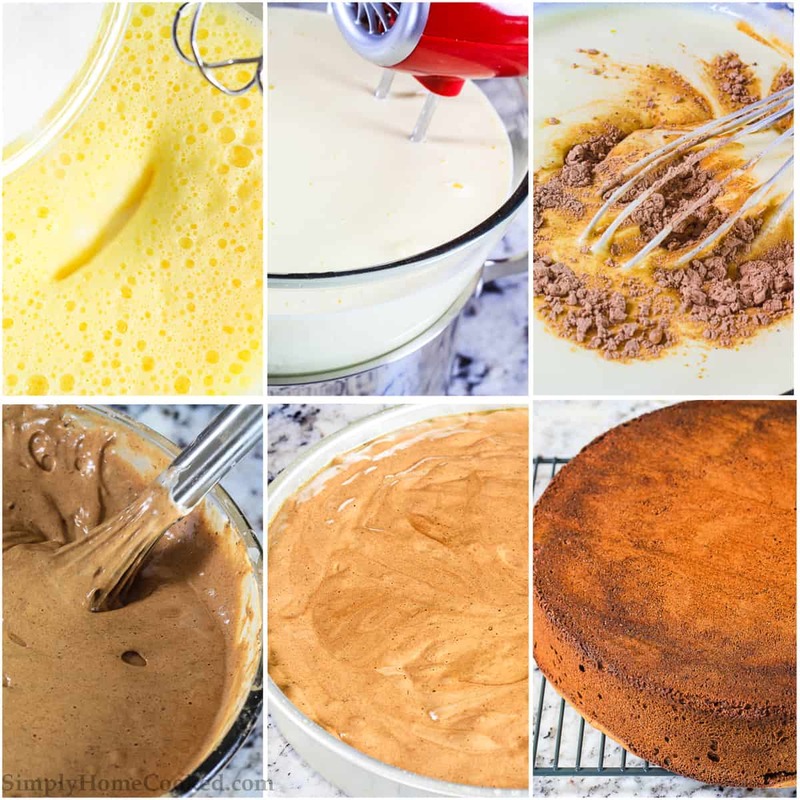 Pour the cake batter into a greased 12 inch round baking pan. Bake at 350 degrees Fahrenheit for 20 minutes and 320 degrees Fahrenheit for 40-50 minutes. Flip the cake onto a cooling rack and let it cool completely. I usually let it cool overnight. Using a serrated knife, slice off the top of the cake. Then run a knife along the edge of the cake leaving about 1/4 inch of the rim. You can leave less, that's even better, but there's always a risk of having it fall apart if it's too thin. Once the cake is cut around the edge, remove all of the insides, crumble it up and set aside. Leave about 1/4 inch at the bottom as well. You should end up with a hollow cake or a "cake shell". In a saucepan lightly beat 4 eggs with 1/2 cup of sugar. Then whisk in 1/2 cup cocoa powder. And add 1/2 cup milk. Place the saucepan over low heat and stir constantly until the mixture thickens. Do NOT let the egg mixture boil or else you will end up with chocolate scrambled eggs. While the chocolate mixture is cooling down, beat 4 sticks of softened butter with 1 1/2 cups sugar. Beat until the butter becomes light in color and fluffy. Strain all the liquid out of the rum soaked cherries and slowly pour the rum liquid into the whipped butter while the mixture is on medium speed. Make sure to pour very slowly to prevent the butter from separating. Add the cooled chocolate mixture to the whipped butter and mix just to combine. Take all of the cake crumbs and blend it into the chocolatey butter using the paddle attachment on medium high speed. Then add in the strained cherries and mix just to combine. Fill the cake shell with the chocolate butter and crumbled cake mixture. Be very gentle when filling the cake. Support the sides of the cake as you press the filling in. Smooth it out with a flat decorating spatula to give it a clean finished look. At this point you can leave it as is or coat it with a chocolate ganache. 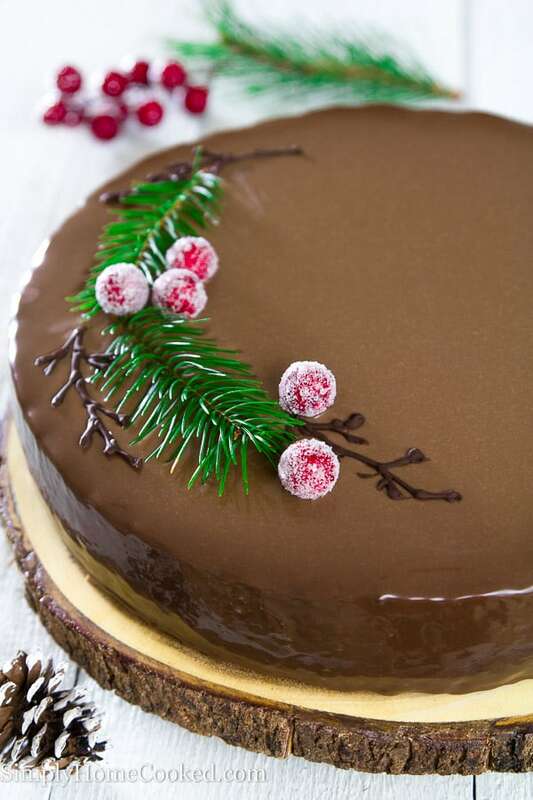 For the ganache on this cake is used 16 oz milk chocolate, 8 tbsp butter, 8 tbsp honey, and 1 1/2 cups heavy cream. Hi, Dina. At first, I was glad that I found the recipe without sweetened condensed milk. But when I read entire recipe, I became concerned about the sugar content:5 CUPS of SUGAR in one cake and plus to this the cherries were in light syrup and 8 Tbsp. honey in the ganache. Dina, I made this cake before and it was AMAZING! I will be making it again very soon for a Christmas new years party! Thanks for sharing! Thank you for sharing your kind feedback, Galina! I appreciate it so much! I really like decoration on your cake how did you do The red snowy balls? Dina, I never ventured out to make this but Galina made this labor of love several weeks ago and it was so delicious! Even the presentation looked similar to yours. Everyone really like it! I heard she made it for a party with the girls. She sent me a photo and it looked amazing. So glad you all enjoyed it! Wow! Definitely one of the best drunken cherry cakes I have ever tasted, and your presentation was on point. I made it a little less drunk (just personal preference), but other than that I followed the recipe almost exactly, and everyone loved it. Thank you for sharing this recipe. I love this cake! I’ve never had it but it looks like it would be amazing! Wow this is such a beautiful cake. I used to make using a similar recipe, yours looks much better though. I’ll have to make it for new years party for sure! Lol Anna you’re funny 🙂 and thank you! I plan to make the belochka cake soon! Wow! Dina you are such a talented young lady. I am impressed! Will bake this cake on holidays for sure. Thank you Yelena 🙂 I am so excited for you to try my recipe! This cake looks so beautiful! 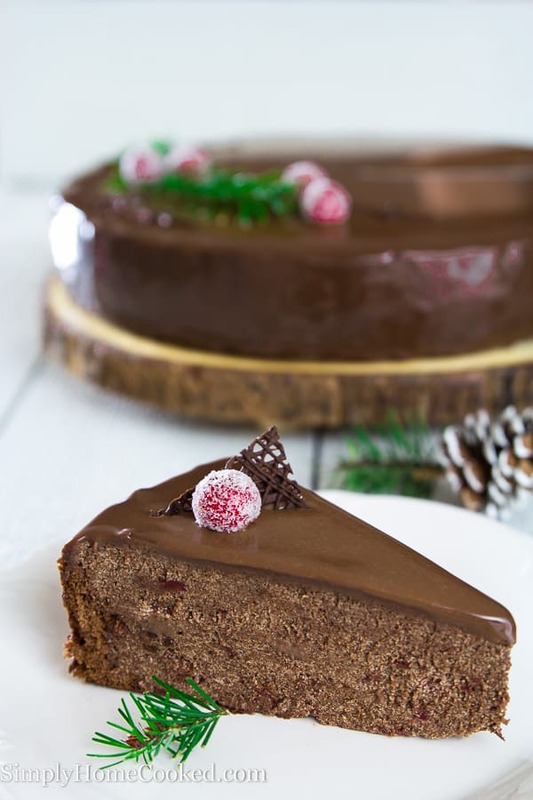 Your photography is perfect:) I love this type of cake, it would be perfect for Christmas.